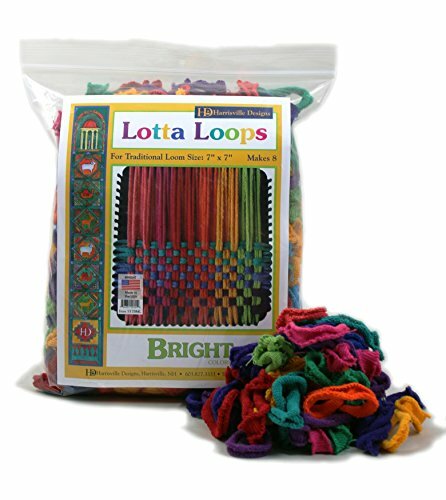 With Harrisville Designs Lotta loops, you get a pack of loops in Assorted colors, custom sized for harrisville's 7'' X 7'' Traditional potholder Loom (Loom sold separately). The bag contains enough 100% cotton loops to weave 8 unique potholders (6" X 6" Finished size). These loops are now available in 12 beautiful colors (does not include black and white): plum, purple, blue, turquoise, peacock, green, spring green, yellow, orange, Red, pink and salmon. Children can enjoy this quiet-time activity, Perfect for rainy days, sick days or car trips. While having fun, they are learning hand-eye coordination, patterning, and refining small motor skills. Hand weaving, knitting and felting are wonderful intergenerational activities your whole family can share. These loops do not fit the larger-size Harrisville potholder Pro Loom (sold separately). All Harrisville products are made in the USA. For ages 6 and up. established in 1971, Harrisville is a small, family-owned and operated business. We believe that quality should not be compromised for even the smallest product. Our goal is to preserve and share the textile heritage of our small new Hampshire village, by providing the highest quality materials for easy projects you and your children can make at home. 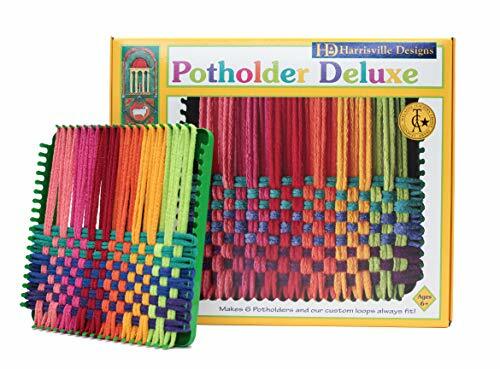 Harrisville Designs 7" Potholder (Traditional Size) Deluxe Loom Kit makes 6 Potholders. Children can enjoy this quiet-time activity, perfect for rainy days, play dates or car trips. While having fun, they are learning hand-eye coordination, patterning, and refining fine motor skills. Hand weaving, knitting and felting are wonderful intergenerational activities your whole family can share. 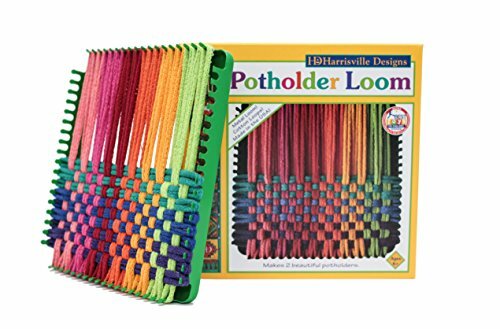 The Harrisville Designs 7" Potholder Deluxe Loom Kit includes: Sturdy Metal Loom 7" x 7" 3 Bags Custom-Sized Multicolored 100% Cotton Loops 2 Hooks (one metal for loop weaving and one plastic for finishing) Illustrated instructions for lots of ideas. 2018 enhanced loom improved to help loops stay nicely in place during weaving! Makes 6 Potholders. All Harrisville products are made in the USA. From the Manufacturer Established in 1971, Harrisville is a small, family-owned and operated business. We believe that quality should not be compromised for even the smallest product. Our goal is to preserve and share the textile heritage of our small New Hampshire village, by providing the highest quality materials for easy projects you and your children can make at home. Harrisville 7-inch Metal Loom kit makes beautiful 6" x 6" potholders. Versatile tools and instructions allow you to make any custom design. Hand weaving is a time-honored, educational and fun activity for children and adults alike. For the New Sewer: Teacher- designed Unicorn and Rainbows Sewing Kit has everything needed for your child to easily succeed in this DIY Craft! sewing these adorable 5 inch stuffed animals! Each of these five creations has been designed with young sewer's skills in mind. Easy to follow directions as well as all the materials needed for each project is included! Box is 8" x 12" - makes a wonderful birthday gift for kids ages 5 - 12. Beginning sewing projects for kids that are teacher approved,easy to sew even for those adults who have novice sewing skills. 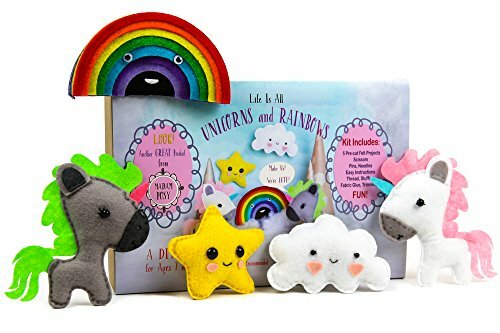 STEAM TOYS are all the rage and The Unicorn and Rainbows kids sewing kits for beginners not only teaches the dying art of hand sewing but encourages creative play. Our beginner sewing projects for kids are outstanding! Also makes a good gifts for tweens. After sewing, boys and girls love to use their Unicorns with their legos to create hours of fantasy play. A wonderful gift for girls & boys, a shared craft activity for children, siblings and friends. One of the best craft for girls or boys to learn. Sewing projects are great travel activities for kids. Wonderful collectible stuffed animals that will give your stuffed animal doll lover something to collect and share! Eco-friendly die cut felt shapes, non-toxic glues and other supplies makes this Unicorn Sewing Kit a higher end gift. No plastic, cheap materials that will break! Ideal sewing kit for tween girls. 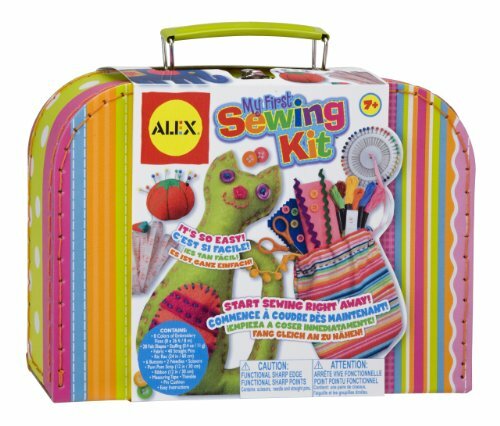 Our sew kit for kids can be used on the sewing machine. Sewing for kids is easy with projects to sew at home and gives your child creative roots to grow on. HIGH QUALITY EDUCATIONAL TOY OR GIFTS FOR KIDS AGES 4+ - Each of the stuffed animals are made from cutout, eco -friendly and kid - friendly felt and stand around 5 inches tall. 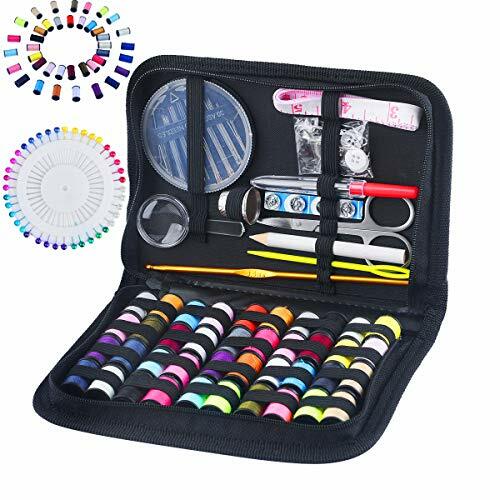 6 embroidery yarn thread colors, 5 needles, scissors, 26 pearl straight pins, buttons, stuffing, non-toxic fabric and craft glue, with easy-to-follow VISUAL instructions and carry case. ADDED BONUS: a magical castle scene is printed inside each box to color and use as a backdrop during play. HOST THE PERFECT UNICORN BIRTHDAY PARTY, GIRL SCOUT MEETING OR OTHER EVENT CRAFT - At your next birthday party or get together, take out the Unicorn and Rainbows Craft Sewing Kit for the instant Wow factor for your child and friends! Each kit contains enough supplies for 5 children to sew and decorate their Unicorn themed creatures in about 25 minutes. Perfect for birthday parties and easy enough for beginner sewers to learn. BUILDS SELF-CONFIDENCE - Encourages children to put away the electronics and enjoy the arts! Create something with their hands, using their imagination. Research shows that when children are encouraged to designs and build things for themselves, it builds self-confidence and sense of self-worth. LOOK WHAT I MADE! MAKING IT FUN! THOUGHTFUL PLAY - At last, an adorable Unicorn and Rainbows sewing kit that teaches the timeless and dying art of hand sewing and creative play. A wonderful gift for girls & boys, a shared craft activity for children, siblings and friends. Kids love to use their Unicorns with their legos to create their own mini kingdom. Great to play with your best friend or sibling! hours of fantasy play. With Harrisville Designs Potholder loom kit, you get all the tools that you need to create your own beautiful 8 x 8 potholders. The kit contains 1 sturdy metal 10" x 10" potholder loom, 2 plastic hooks, illustrated instructions, and enough cotton loops to create 2 of your own 8 x 8 potholders. 2018 enhanced loom improved to help loops stay nicely in place during weaving! Our loops are now available in 30+ beautiful colors (additional loops and colors sold separately). Children can enjoy this quiet-time activity, perfect for rainy days, play dates or car trips. While having fun, they are learning hand-eye coordination, patterning, and refining fine motor skills. Hand weaving, knitting and felting are wonderful intergenerational activities your whole family can share. This kit is not compatible the smaller-size Harrisville Potholder traditional 7 cotton loops (sold separately). All Harrisville products are made in the USA. From the Manufacturer Established in 1971, Harrisville is a small, family-owned and operated business. We believe that quality should not be compromised for even the smallest product. Our goal is to preserve and share the textile heritage of our small New Hampshire village, by providing the highest quality materials for easy projects you and your children can make at home. 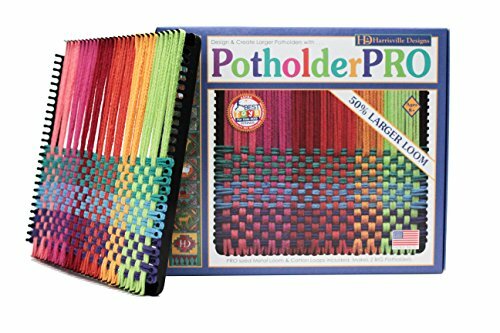 Harrisville 10-inch PRO Metal Loom kit makes beautiful 8" x 8" potholders. Preserves the New Hampshire tradition of handmade textiles produced exclusively in the USA. Includes 1 10x 10 metal loom, 1 plastic hook, 1 set of cotton loops, and illustrated instructions. Catching sweet dreams has never looked so beautiful! using this kit, novice crafters will learn how to assemble their very own dream catcher, covered in glimmering beads and glossy ribbons. Encourages fine motor skills, hand- eye coordination and visual perception and gross motor skills. Make it Real and bring the world of creativity to life! inside, find beautiful products and a dream guide magazine that profiles the lives of women working in creative Industries. Download our free app for a broader experience! create, dream, share .repeat! includes metallic ring, silver cord (2.5m), over 225 stylish beads, 6 colours of satin ribbon (23m), printed butterfly, gem stockers, clear thread (3m), dream guide magazine, and instructions. PLEASE retain packaging since it contains important information. Product and colours may vary from those shown. Not suitable for children under 8 years old. Choking hazard small parts. DIY DREAMCATCHER. 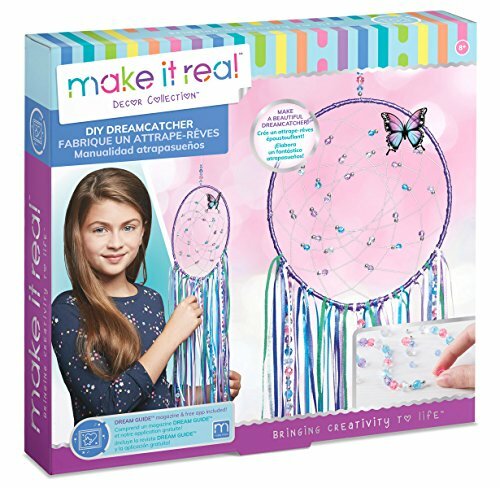 This girls' arts and crafts kit will unleash your tween daughter's creativity and artistic talents while guiding them through crafting their own beautiful dream catcher! HELPS KIDS DEVELOP REAL WORLD SKILLS. The DIY Dreamcatcher helps young girls develop fine-motor, visual, and general motor skills - all while having a blast and expressing their creativity! Make a butterfly bag, neck purse, picture frame, notepad cover and pencil case. Stitch the pre-punched sections together with the cord and decorate with foam shapes and stick-on gems. Contents: 5 sewing kits of pre-cut foam pieces and cord, plastic bodkins, stick-on gems, notepad, 2 pencils, guide. 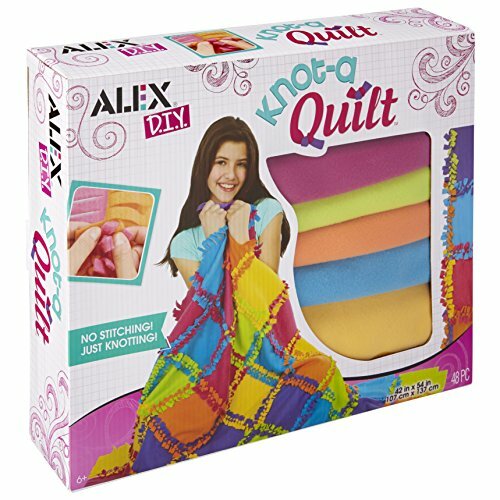 ALEX DIY Knot A Quilt Kit is an easy way to instantly create a super soft quilt. There is absolutely no cutting, sewing or knitting involved! Simply tie the pre-cut fringe squares together one by one. The fleece squares come in 6 bright colors. Kids will be able to knot a 3.5 foot by 4.5 foot quilt in no time! Includes 48 fringed 9 inch squares. Recommended for children 6 years of age and older. 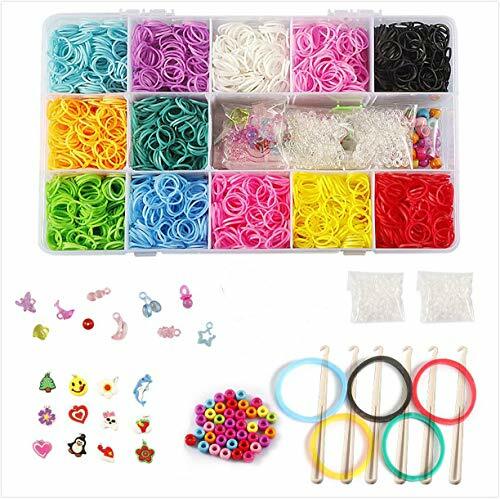 STSTECH looming bands refill kit contains all you needed except loom board to create lovely rubber band bracelets, friendship rings, necklaces, hair accessories and more gadgets! It is very easy to make, lots of videos on YouTube show you how to create the loom band bracelets and other accessories of your own. Click the blue "STSTECH" link at the top of the page by the title, to see all of our great products! Click the ADD TO CART button above to Order Yours Now! FUN -Rainbow colors(elastics) are not alone in the refill kit,since there're hooks,beads,charms and clips.BIG LOOM BOARD not included. (few colors/patterns(bands/charms) may vary depending on production batch). SAFE -Rubber Bands are Lab Tested and 100% Free from Latex, Phthalates & Lead. Recommended for ages 5 and up. WARNING: Choking Hazard. Keep out of reach of children under 3 years. ORGANIZED - Portable carrying case with 5 movable Dividers for Customizable Storage after looming.Great selection of colors are found in the correct compartment. VERSATILE -Use it for different things that you can ever imagine, small gadgets & decoration looming arts/crafts comes with endless possiblity. LIVE GUIDE - Search LOOM BANDS on Youtube, lots of looming fans share how to work out unique crafts step by step.You can explore and bring out your creativeness with this loom band kit. 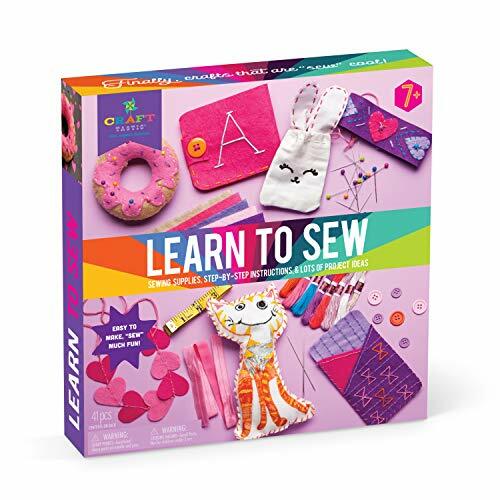 "Craft-tastic s Lean to Sew Kit is tailor-made for sewing fun. Kids learn a variety of sewing skills using a variety of materials and techniques to create 7 fun little crafts. The kit includes an instruction booklet the ll use over and over, plus items like a measuring tape, pins and needles they ll use time and again, too. Sew cool! Why Craft-tastic? Craft-tastic represents all that s cool and trendy in the amazing world of crafts. Only the highest quality materials and components are used in Craft-tastic craft kits. They re specialty products, without specialty pricing. Ann Williams Group is a small, Michigan based, women owned company that makes the Craft-tastic and Craft Crush brands. Our CEO is both a maker and a Mom who is deeply passionate in her beliefs that hands-on making is a critical part of child development. By tapping into their curiosity for creativity, she firmly believes crafts help kids learn to liberate their inner creator, unleash their imagination and gently challenge the conventional by crafting." 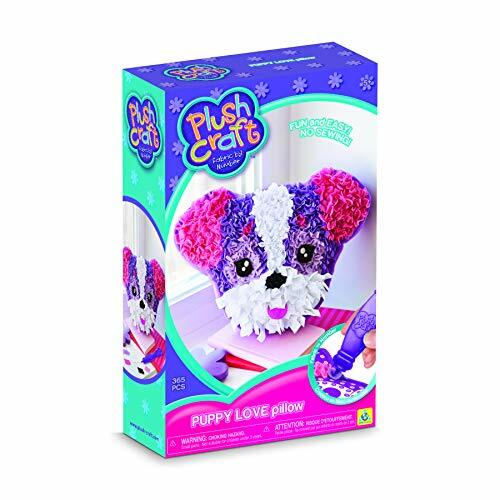 7 CRAFTS IN ONE KIT: They'll make a bracelet, headband, stuffie, bunny pouch, pin cushion, backpack, and a cool phone case. PROMOTES MOTOR SKILLS: 7 crafts will teach kids how to sew a running stitch, blanket stitch, whip stitch and how to decorate with embroidery. LEARN NEW TECHNIQUES: They'll learn to use a measuring tape, handle pins, and learn to sew on buttons and patches, use elastic, and stuff toys they've sewn themselves. 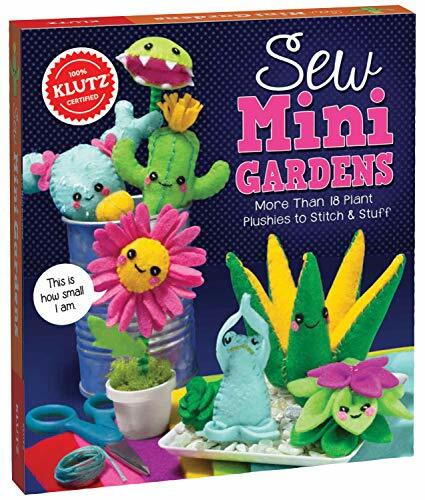 AGES 7+ WILL LOVE THE EASY-TO-FOLLOW INSTRUCTIONS: Kit includes a handy full-color instruction booklet they'll use for these projects-and over and over again for future sewing projects. 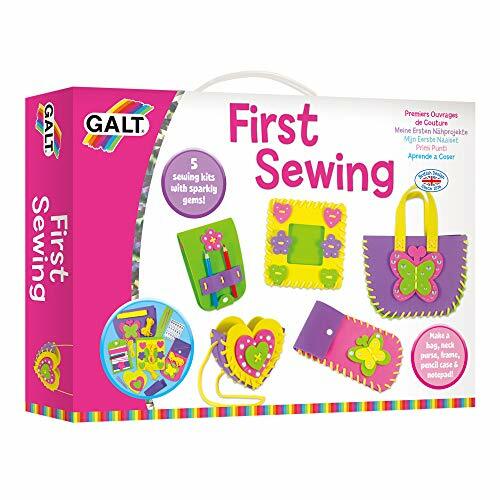 INCLUDES EVERYTHING THEY NEED: Sewing instruction booklet, 36 yd (32.9 m) cotton thread, 15 pins, 2 metal needles, 5 pieces acrylic felt, 1 piece canvas fabric, 1 piece elastic, 6 plastic buttons, 1 measuring tape. With Harrisville Designs Potholder loom kit, you get all of the tools that you need to create your own beautiful 6 x6 potholders. The kit contains 1 sturdy metal 7" x 7" potholder loom, 1 plastic hook, illustrated instructions, and enough cotton loops to create 2 of your own 6 x6 potholders. 2018 enhanced loom improved to help loops stay nicely in place during weaving! Our loops are available in 30+ beautiful colors (additional loops and colors sold separately). Children can enjoy this quiet-time activity, perfect for rainy days, play dates or car trips. While having fun, they are learning hand-eye coordination, patterning, and refining fine motor skills. Hand weaving, knitting and felting are wonderful intergenerational activities your whole family can share. This kit is not compatible with the larger-size Harrisville Potholder PRO 10 cotton loops (sold separately). All Harrisville products are made in the USA. From the Manufacturer Established in 1971, Harrisville is a small, family-owned and operated business. We believe that quality should not be compromised for even the smallest product. Our goal is to preserve and share the textile heritage of our small New Hampshire village, by providing the highest quality materials for easy projects you and your children can make at home. Includes 1 7x7 metal loom, 1 plastic hook, 1 set of cotton loops, and illustrated instructions. The Orb Factory Limited is a provider of award winning crafts and activity products. With over 20 years in business, we are always creating brand new lines and exciting new products. We are now sold in over 60 countries, have won numerous awards and have become a recognized and trusted name in the toy industry. Application Knit your own scarf, hats, and even a sweater with this knitting machine. Simple Use Adults or children need a little bit of knitting experience to guide your baby, your baby will be able to weave a small hat. Function Knitting machine can be used to develop kid's hand-eye coordination ability. Educational Toy Hand-operated wool knitting machine, this is a great way to introduce children into knitting in a fun way! Quality Guarantee Free exchange within 12 months product warranty. If you have any problem within 12 months, please feel free to contact us. 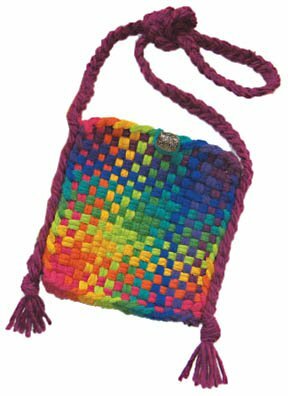 Harrisville Designs potholder purse kit (Rainbow) is a wonderful way to make something beautiful and practical with your potholder Loom. The kit includes enough 100% cotton loops to weave 2 potholders. You can sew the resulting 6" X 6" Potholders together and add a strap to make an adorable little purse. We've even included The loops you need to complete this project. The kit includes 100% wool yarn for the strap, fleece for making felted buttons (colors may vary), 2 hooks (1 for weaving and 1 for finishing) and illustrated instructions. Needle and thread for sewing The potholders together are not included. Suitable for ages 7 and up.Established in 1971, Harrisville is a small, family-owned and operated business. We believe that quality should not be compromised for even the smallest product. Our goal is to preserve and share the textile heritage of our small new Hampshire village, by providing the highest quality materials for easy projects you and your children can make at home. All Harrisville products are 100% Made in the USA. Bright and colorful pom poms are perfect for craft time! Super soft and fuzzy, these are sure to make any craft stand out. Mix and match or make rainbows! 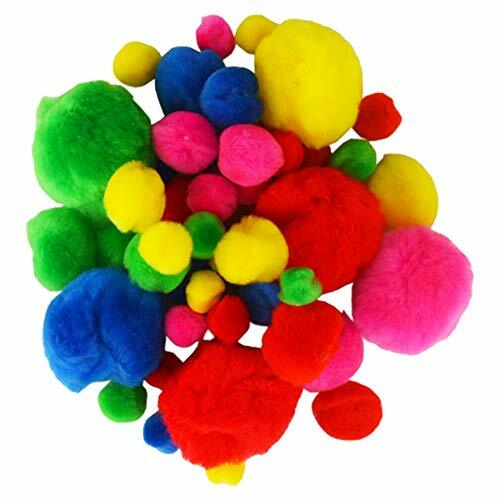 This set includes pom poms in five assorted bright colors: pink, red, yellow, green and blue. Assorted sizes measuring 0.5" - 1.5" make these perfect for any craft! Embellish tote bags or make animals - the possibilities are endless. This crafting staple is a must have in your classroom or art supply stash at home. Package includes 6 bags of 50 pom poms, 300 pom poms total. Note: other pictured craft supplies and accessories not included. Bright and colorful pom poms are perfect for craft time! Super soft and fuzzy, these are sure to make any craft stand out. Mix and match or make rainbows! This set includes pom poms in five assorted bright colors: pink, red, yellow, green and blue. Assorted sizes measuring 0.5 - 1.5 make these perfect for any craft! Embellish tote bags or make animals - the possibilities are endless. This crafting staple is a must have in your classroom or art supply stash at home. Package includes 6 bags of 50 pom poms, 300 pom poms total. Note: other pictured craft supplies and accessories not included. Brand: Novelty, Inc. | Manufacturer: Novelty, Inc.
Rhinestones Size :10mm Width Crystal Applique. 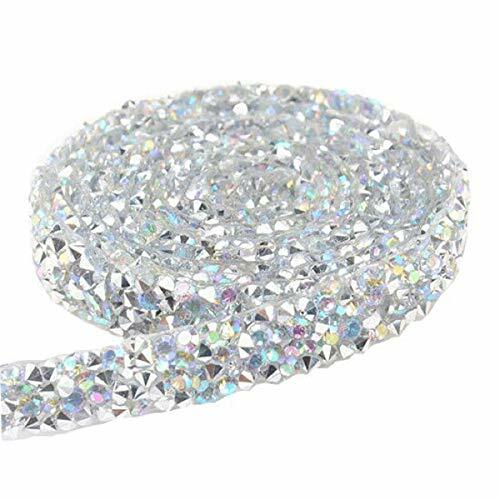 This hotfix rhinestones Chain, the bottom have the Hot Melt Adhesive, when iron on,Control the temperatures in 130-180 ,the Hot Melt Adhesive will melt, recommend iron form the back of the Chain. 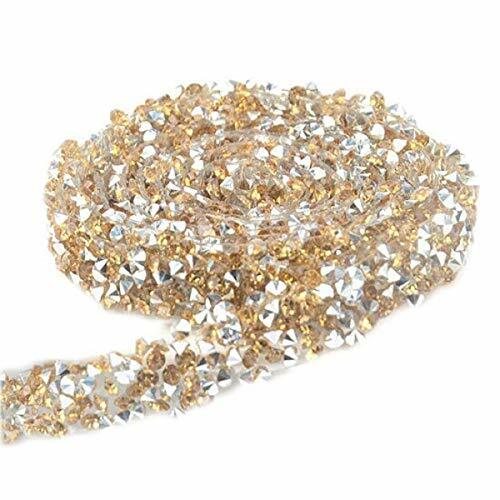 Length: 5 Yard Rhinestones Chain. 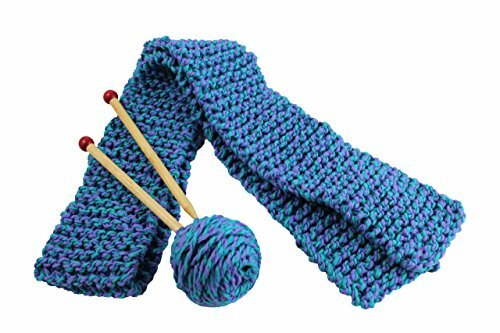 The quick to knit Blue/Purple from Harrisville is an easy kit that comes with everything kids need to create their own two tone 3" X 50" Scarf. The single garter stitch is easy to execute and comes with illustrated instructions. Includes wooden knitting needles as well, making this an essential kit for beginning knitters. Great for a rainy day or just an educational way to keep small hands busy, This kit is for ages 8 and up. The Harrisville quick to knit - Blue/Purple kit is perfect for first time knitters! 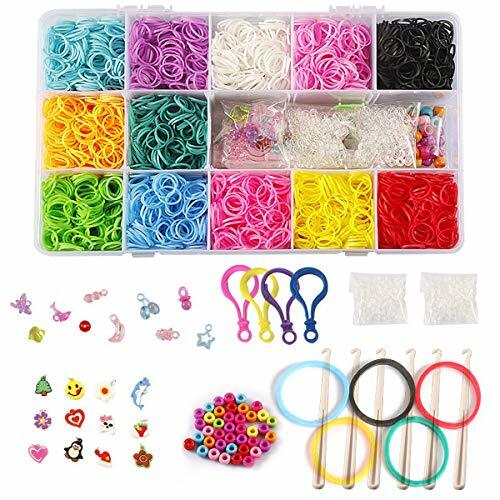 looming bands refill kit contains all you needed except loom board to create lovely rubber band bracelets, friendship rings, necklaces, hair accessories and more gadgets! It is very easy to make, lots of videos on YouTube show you how to create the loom band bracelets and other accessories of your own. Rainbow colors(elastics) are not alone in the refill kit,since there're hooks,beads,charms and clips.BIG LOOM BOARD not included. (few colors/patterns(bands/charms) may vary depending on production batch). Rubber Bands are Lab Tested and 100% Free from Latex, Phthalates & Lead. Recommended for ages 5 and up. WARNING: Choking Hazard. Keep out of reach of children under 3 years. Portable carrying case with 5 movable Dividers for Customizable Storage after looming.Great selection of colors are found in the correct compartment. Use it for different things that you can ever imagine, small gadgets & decoration looming arts/crafts comes with endless possiblity. 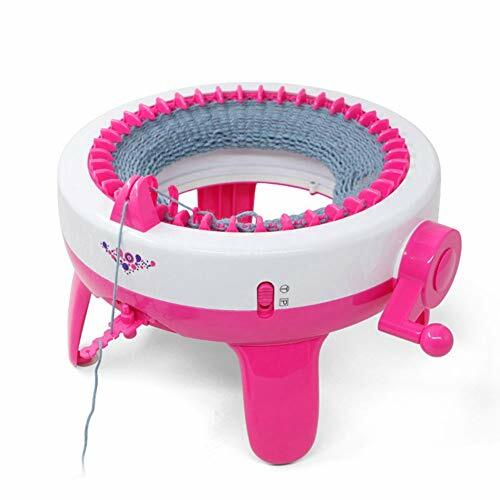 Kids loom is perfect birthday gift and Christmas present for children, and it is a connective product for you and your kid, keep happy time with your kid, accompany with them in their happy childhood. Also it is a great product that keep your children away from cell phone and ipad, good for children. This DIY craft kit contains all you need to make one stunning dream catcher. It includes wooden ring, feathers, beads and yarn required to make one complete dream catcher. This kit is a great activity to engage kids and encourage their hidden artist. A detailed instruction guide is provided with each kit explaining every step. It makes up for a delightful gift for kids over age of 8 years. Craft is a great activity to encourage creativity and originality in every child and this kit will help nurture these skills in every kid. According to Native American theories; the inner web of a dream catcher catches the bad dreams, letting only the good ones to pass through. The prime idea behind our DIY kits is to help develop very important skills in each kid along with a fun experience. This kit helps the child to increase FOCUS (by weaving the intricate web pattern); encourage SELF EXPRESSION (by using the contents to create various designs) and BOOST SELF ESTEEM by channelizing his/her energy into positive endeavors and a sense of creating something useful. ONE STUNNING DREAM CATCHER: This DIY craft kit contains all you need to make one stunning dream catcher. 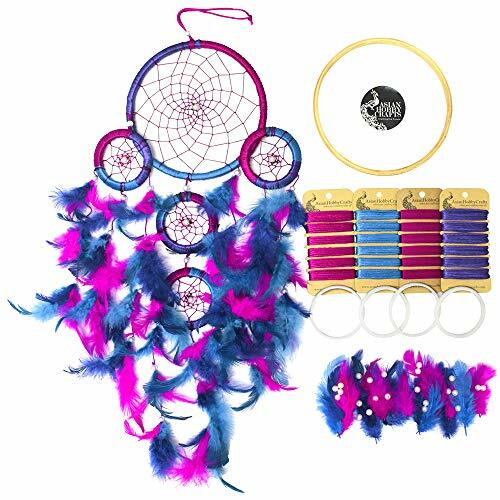 It includes wooden ring & Plastic rings, feathers, beads and yarn required to make one complete dream catcher. FUN TO MAKE: This kit is a great activity to engage kids and encourage their hidden artist. A detailed instruction guide is provided with each kit explaining every step. Also, make sure to check out our detailed instructions video on how to make a dream catcher by subscribing to our channel 'Asian Hobby Crafts' on YouTube. GREAT FOR GIFTING: It makes up for a delightful gift for kids over age of 8 years. Craft is a great activity to encourage creativity and originality in every child and this kit will help nurture these skills in every kid. MEANINGFUL ART PIECE: Apart from being a thing of beauty, dream catchers are also believed to eradicate bad dreams. According to Native American theories; the inner web of a dream catcher catches the bad dreams, letting only the good ones to pass through. DEVELOP SKILLS: The prime idea behind our DIY kits is to help develop very important skills in each kid along with a fun experience. This kit helps the child to increase FOCUS (by weaving the intricate web pattern); encourage SELF EXPRESSION (by using the contents to create various designs) and BOOST SELF ESTEEM by channelizing his/her energy into positive endeavors and a sense of creating something useful.